My dear readers: Over this last year I have come to feel like so many of you are my long-distance pen pals—my good friends. So as such, I’m totally behaving like a “girlfriend” today in sharing with you what I did last night. I was so pleased with how class turned out that I just couldn’t wait until “later” to tell you all about it. I’m quite certain that if you try out this process and the accompanying recipe that you will LOVE the results as well—and be a bit surprised with how great it is too. So last night I was teaching my Wonderful World of Wheat class. I usually demonstrate making bread in about an hour and 15 minutes, how to sprout wheat, and then how to make wheat meat and use it in a “meat focused” dish. I suppose I could “smuggle” the wheat meat in a dish for starters, but I prefer the “gloves-off approach” in my classes, and then let folks scale back however they’d like. This way they can approach the use of wheat meat in whatever capacity makes them more comfortable, instead of me teaching them to be timid with it in the first place. So last night I made the wheat meat taste like chicken. Heck, it even looked like chicken. So let me share with how I did that. Take 2 cups of vital wheat gluten and put it in a bowl. Add about a teaspoon of the Shirley J Onion Seasoning, a dash of salt and pepper, and about a teaspoon of the Shirley J Pizza & Pasta Seasoning and 1 tablespoon of nutritional yeast. * With your hand, just mix it all together. Then scoop the dry mixture to the sides of the bowl, making a concave hole for the liquid to go into. Then add 2 cups of tepid chicken bouillon into the concave portion. (I make the chicken bouillon with the Shirley J version because it costs less, has less of a salty taste, and no added MSG.) With your hand, gently but quickly work in the dry ingredients into the bouillon. 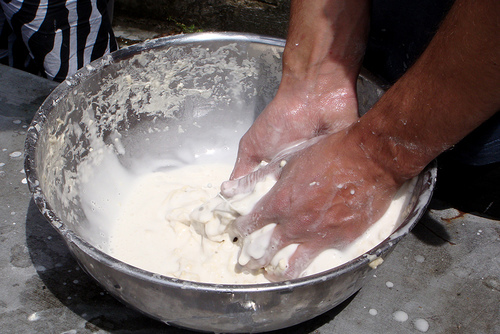 Keep working the mixture together with your hands. You will end up with a texture similar to silly putty. You will need to work with it quickly because it quickly gets rather rubbery due to the gluten. Flatten the mixture out a bit and then cut it up into small ¼ in squares. This recipe will make TWICE as much “chicken” as you will need for the casserole recipe, so I’m going to give you another option to use it for as well. *nutritional yeast can be purchased in “bulk” at any health food store, and has a nice long shelf-life. The Shirley J products are on a special sale this month at a “group buy” price through Five Star Preparedness— www.fivestarpreparedness.com/GroupBuy. In a large pot, put about 6 cups of water and 2 teaspoons of the Shirley J Chicken Bouillon. Place HALF of your ¼ inch sized pieces of the wheat meat. (I use my pressure cooker for this portion as it cooks much faster.) Bring the chicken broth to a boil and then gently place the cut wheat meat in the broth. Allow to boil/simmer until the wheat meat has increased in size about 4 times (if you’re using a pressure cooker, this will take about 15 minutes at high pressure). Remove the wheat meat and place it in a large mixing bowl. Take 1 cup of Shirley J Universal Sauce and add 2 ½ cups of the hot chicken bouillon. Whisk together until thickened. Add 1 ½ teaspoon of cinnamon, 1 teaspoon of nutmeg, and a dash of pepper to the sauce. Mix well. Then pour the sauce over the cooked wheat meat in the bowl. Add 2 cups of frozen vegetable and a ½ cup of parmesan cheese. Mix together until the vegetables and wheat meat is covered in the sauce. Transfer mixture to a large casserole dish. In a separate bowl take 3 cups of the Shirley J Biscuit mix and add 1 ¾ cup of water. Whisk together well. Them mixture should represent more of a lumpy cake mix than biscuit dough. Pour this mixture evenly over your wheat meat mixture in the casserole dish. Cook at 375 degrees Fahrenheit for 25-30 minutes. This wheat meat will simply melt in your mouth. There is no unpleasant taste or texture about it. 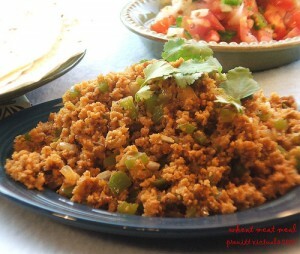 This dish is fantastic and I make the wheat meat specifically so that I can make THIS dish. I had some leftovers last night that I brought home. I hadn’t had dinner and was SO dang tempted to eat it, but at 9:00 at night I knew that wouldn’t be wise so I put the leftovers in the fridge and went to get a couple more hours of writing in for the night. This morning I was SO looking forward to eating it for breakfast. But alas, my silly husband gave this scrumptious dish to our two pampered pooches for breakfast! I was so grumpy about that one! Now, what do you do with the rest of the mock chicken wheat meat? Well, if it were me, I’d boil it just like you did the previous batch—in 4-6 cups of chicken broth OR I would bake it until it puffs up about 3 to 4 times in size. If you bake it, bake it at about 350 degrees for 25-30 minutes. Then soak the wheat meat pieces in about 2 cups of buttermilk or soy milk for about 5 minutes. Then dredge them in 3 cups of rice flour or matzo meal. Then deep fry them like you would your own chicken nuggets, and Voila! You’ll have the best tasting, light and crunchy chicken nuggets that you’ve ever had before! 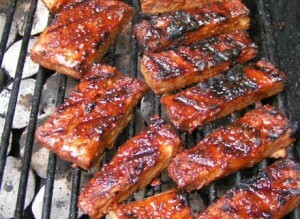 (And don’t forget to serve it with the Shirley J BBQ sauce that so many are in love with too. Last night, instead of having “just plain delicious BBQ sauce” we had it mixed with root beer, peach preserves, Worchester sauce and vanilla, and all kinds of other flavor combinations. (Separately, not together, folks) The BBQ sauce was so wonderful that folks had more than one piece of wheat meat—even though I scorched it a bit. Yup, good BBQ sauce cures all cooking mistakes. The other option is to grill the pieces or fry them in a non-stick skillet after you boil or bake them. Using these options is definitely a way to get wheat meat into your family’s diet and ensure that you’re serving an affordable protein that’s hormone, MSG, antibiotic, and e-coli FREE. Sounds like a delicious and healthy plan to me. When I cooked it I boiled it in broth, then I let it marinate. It did stay in the marinate for a day and a half because grandma came and got all the kids and we went to pick them up. Otherwise I would have used it the same night. Maybe that was the problem. Will I get a dryer texture if I bake it instead of boil it. I'm going to give this recipe a try, as I've got a lot of vital gluten I can use. One more question, can you freeze wheat meat? Or is it better to just make smaller batches rather than try to store it for very long? Thanks! Yeah, I wouldn't ever soak wheat meat longer than 5 to 10 minutes. And yes, you get a very different texture when you bake it instead of boil it. I have never frozen wheat meat. So I really don't know the answer to that question--sorry. I just make it up each time I want to use it. It's so easy that way and it's so hard to work with a larger batch fast enough. So that's why I've never frozen it. by the way, here's another idea-- next time let the broth BE your marinade. Flavor that however you want it to taste. There's no need to do a second step like marinade really. As always, I marvel at the time you take to learn about all these things we need to know, and then be so womderful as to share it with all who have the desire to learn more. Do you have other similar way to use wheat meat - things that actually taste good, so that we will prepare and eat them? Or...know of a website that has good ideas? D'Ann, thank you for your kind words. If you do a search on our blog for "wheat meat" you'll see two other articles in which I listed some recipes. Also, I like to watch the YouTube videos on "wheat meat" or "seitan" to get some great ideas. I'm presently writing a cookbook that will have a wheat meat section as well. Hey Kellene, Great artical. Now more research for me. You have already given me some good book choices (cannot hardly wait for your wheat book) Sorry that I missed the Webinar on Thursday, electical went out. Hope there are some repeats in the furure. 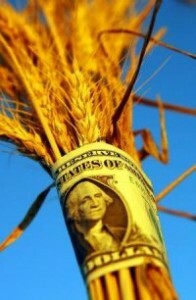 Have been buying up wheat and learning to use it, at a slow pace. How do you feel about wheat grass? I would like to learn more about it....been using the Sprout People for that, now want to learn how to juice it. Buy the way could you please expalin more about wheat glutin......Thank you,Friend. You have given me a whole new perspective on life in the last year. Is there a difference between vital wheat gluten and vital wheat gluten flour? I found the flour at Earth Fare yesterday. If there is a difference, where can I get just the gluten? I wish I could answer that question. This has been a LOT harder of a task than I expected. *sigh* I'd make use of the website until it comes out also the book called "The Dinner Doctor Cookbook" She's got great recipes that are open, heat, dump kinds of recipes. She uses some fresh ingredients too of course, but it's a really good place to start.